Julie and I headed up to Garzal by chalupa on Wednesday morning. A chalupa, you may remember, has nothing to do with Taco Bell, but is instead a Magdalena River mini-bus on steroids. 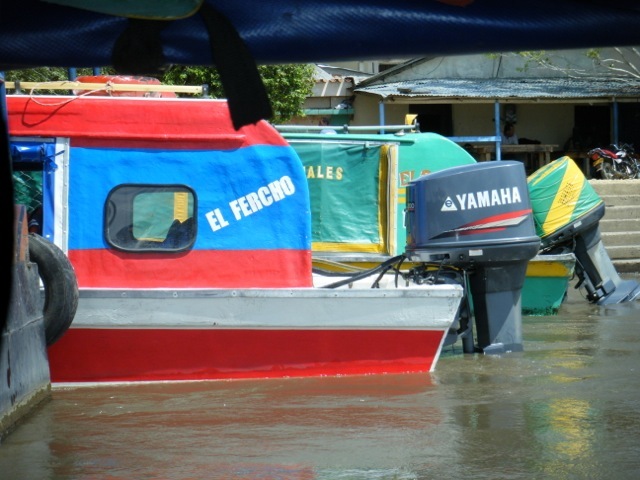 Twenty-plus passengers and their luggage use these to reach the hundreds of small river communities located throughout the wetlands of the Magdalena basin. After about a three hour ride we arrived at the drop-off point where we meet the 35 ft outboard powered canoe with the two Swiss volunteers we are relieving. These canoes are all called "Johnsons" after the original motors that most people used. 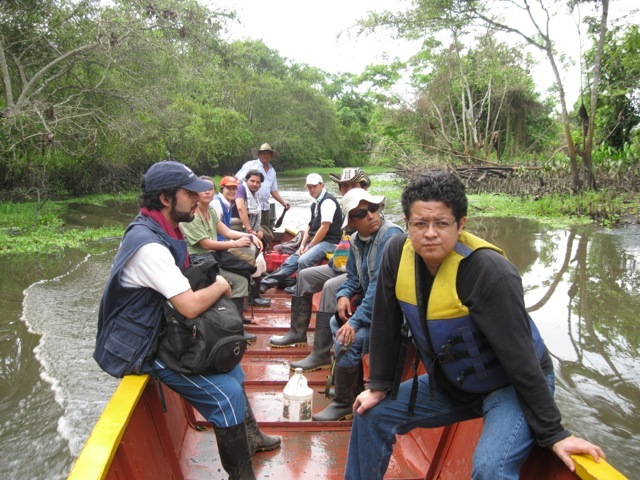 This canoe is piloted by Pastor Salvador, the community leader who is hosting the commission made up of the eight other non-governmental organizations (NGOs) we are accompanying. We wind up a small river branching off the Magdalena and then onto a small caño or stream that takes us directly to his home where we are all being hosted. Julie thought you might want to know about our housing arrangements. Some of us are being hosted in Salvador's house. Chickens and dogs share the house. Within fifty feet of the house are an orange tree, a mango tree, a papaya tree, a six foot hot pepper plant, and lots of bananas and plantains. Most of the men are sleeping in hammocks in the adjoining church space. Someone has a small hiking tent on the altar. Julie and I share a double bed, and everybody, family included has mosquito nets. Salvador has electricity via a generator that he runs from dark at about 6:30 PM till the "Colombia Has Talent" TV show goes off at about 10:30 PM. There are no fans other than the one by the TV. Using the bathroom after sundown puts Julie at great risk for mosquito bites on the behind. They don't seem to bother me so much. Probably because of my vaccinations in the Boundary Waters of Minnesota. The generator comes on again with the lights at 4:00 AM so that Nidya, Salvador's wife, can start working on breakfast. 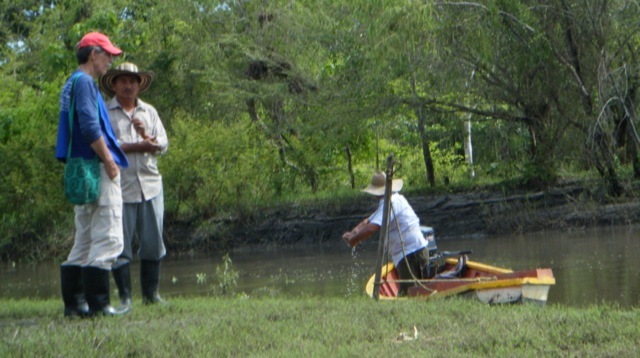 Salvador pumps water out of the river to fill the "pila" (laundry sink) and the tank over the bath/shower. There is running water in the sense that you take the wooden plug out of the shower spout and fill up a bucket for your bath. All toilet flushing is by bucket, but it is nice to have an actual toilet in the campo. Last year I wrote about the Las Pavas community and sent a link to a 13 minute video about the situation in three Colombian communities. Here is that video link again. The first four minutes cover Garzal. It is an excellent intro to their situation. Please take a moment to view it. Current Colombian president Juan Manuel Santos, has made some relatively strong public statements in the last year about his administration's commitment to the land title rights of small farmers. There is much skepticism among CPTers and their friends as to his true intentions. Land titling disputes between campesinos and the wealthy corporate interests (who are interested in the land for gold, petroleum and/or palm) tend to drag on for years. As noted in the video, the dispute in Garzal is between campesinos and the Barreto family who reportedly own over thirty-two thousand acres. Our current accompaniment of Garzal is coming at a pivotal point in their land titling process. Right now, for a little more more than two weeks, the above mentioned NGOs and INCODER (Agricultural Department) representatives are working in three to four small groups interviewing families and taking GPS surveys of their claimed parcels of land. 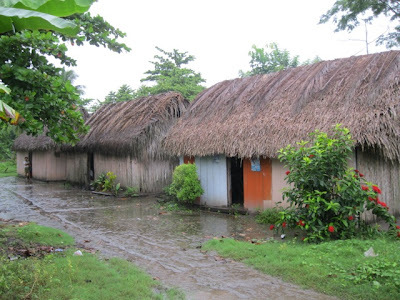 The Barreto family was to send several representatives as well, but when the government decided not to send security forces out for the process, the Barretos backed out, claiming it was too risky because of the guerilla presence in the community. CPT has never been able to verify any guerilla presence. 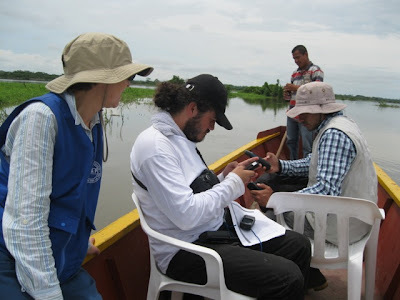 The NGO members travel out each morning by canoe to rendezvous with the INCODER group to split into their respective teams. 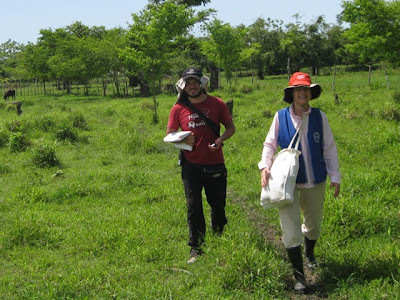 Julie and I traveled with two topographers, one day mostly by foot. The second full day we covered over sixty miles in canoe through an incredible maze of rivers, streams and lakes. Here are some of the complexities faced by this fact-finding group. Campesinos who have never had an actual survey are being asked to testify how much land they have and how much they harvest per acre of various crops. According to Colombian law, no one can own a body of water. In this valley, an area may be used for pasture half the year while the other half of the year the same area will be under three feet of water. Is that pasture or lake? Some families have been in this area 40 years, some 20, some much less. What is the time requirement for establishing title? CPT's role is to provide security for the community simply by being present. It is rare that we confront an obvious threat of violence. It is clear that some families are very nervous at being interviewed by any government official. The regional government has been at the forefront of efforts to evict them. On our third day, security forces did arrive, fifteen regular soldier and two officers, several with diarrhea and vomiting. Two of our accompanying attorneys went to check in with them. The sergeant in charge said he had been instructed to come out and check on the commissions in Garzal though he had never been in the area, had no idea what commission was there, or what their task was. The sergeant then asked the attorneys for suggestions on what they ought to be doing!! What could be riskier than ignorant men with weapons looking for an undefined threat? That night the attorney, addressing other commission members, spoke of the importance of participation by CPT and other international observers as being critical to lowering the threat of physical violence. - Where were you when President Kennedy was assassinated? - Does all of Texas belong to the US or does part belong to Mexico? - How do I think President Obama's recent statement in support of gay marriage will affect his election campaign? - How is my work with CPT funded? Who pays for my pane ticket? Does the Obama administration help finance this sort of work, and how is it different from the work and funding of the other NGO's? These men had a maximum 9th grade education, probably less. Who among us would have been able to ask similar questions about Colombian history, economics and politics? Again I am humbled by the opportunity to meet and work with brothers and sisters from other cultures.